Getting your hands dirty is at the top of a plant physiologist’s job description. 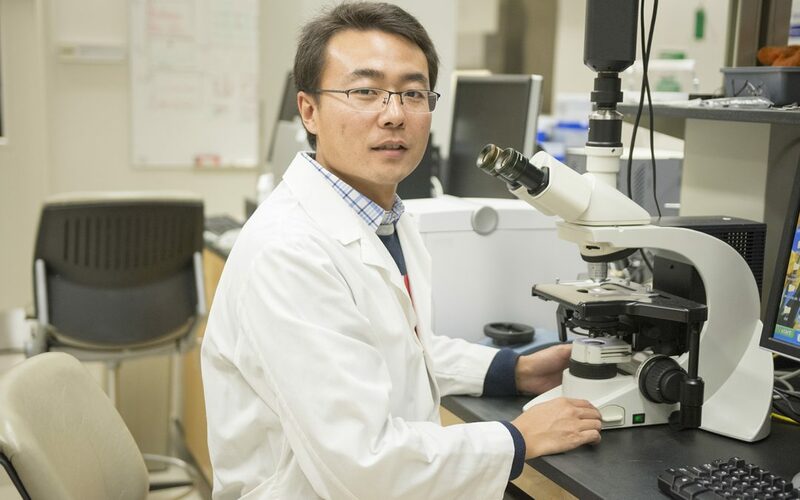 Shuai Li knows this better than anyone, but his love for the research makes hard work well worth the while. After receiving his M.S. in Plant Ecophysiology from the University of Science and Technology of China and his Ph.D. in Plant Physiology from the Estonian University of Life Sciences, Li is excited to complete his postdoctoral research at U of I under the Center for Advanced Bioenergy and Bioproduct Innovation’s (CABBI) Feedstock Development theme. This past April, Li’s family made the move to Champaign-Urbana so that he could join Lisa Ainsworth’s Laboratory. 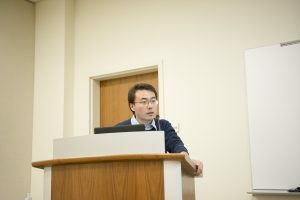 Li was previously acquainted with Ainsworth’s research, having studied her work while researching his own Ph.D. dissertation. He remarks on the similarity of their research areas even before he joined the group. But Li is no stranger to field work: On the contrary, his passion for plant research has led him into the depths of diverse ecosystems and environments over the course of his career. It might not be the most glamorous, but Li has no problem with legwork. The Ainsworth Laboratory’s field experiments are conducted at SoyFACE (Soybean Free Air Concentration Enrichment), where Li’s team examines how Midwestern agricultural crops respond to elevated levels of ozone and carbon dioxide (CO2). To test bioenergy crops like sorghum, SoyFACE has constructed what is essentially an ecological time machine, wherein either gas enriched with ozone or pure CO2 is released into the air via an octagonal array of pipes surrounding designated test zones at levels simulating 2050’s projected atmospheric composition. From May to October, Li’s team works in the fields caring for and observing their crops. This is no job for the faint of heart: It requires countless hours and a team of dedicated scientists taking measurements and conducting field research. In the lab — Li’s preferred office setting — plant samples are tested for measurements like leaf structure, thickness, and the size of veins and stomata (leaves’ “pores”). Li’s research group also studies plant biomass in response to elevated ozone and CO2 concentrations. The big-picture goal is to eventually maximize yields in order to meet the population’s ever-increasing demand for fuel and food. 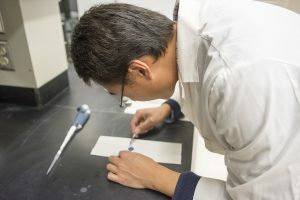 “This is a guide for other scientists in the future so they know how they could improve the yield of biomass, and which direction we can go next,” he says. Part of what makes this project cutting-edge is its emphasis on the true-to-life simulation of tomorrow’s atmosphere. “There are very few labs studying such … experimentation in the field. Lots of study is going on in the lab,” Li explains. Here, Li refers to growth chambers: controlled, indoor micro-environments that test plant responses to increased levels of ozone and CO2. However, growth chamber conditions are often too clinically controlled to reflect real-world scenarios. For example, light exposure is much lower than that of the sun, and weather conditions aren’t nearly as volatile as is common in the Midwest. The environmental variability that makes fields optimal for experimentation comes with challenges of its own. When working outside, weather-related delays are a given: rainfall prevents some experimentation, and the airborne dispersal methods are easily impacted by wind speed and direction. However, Li agrees that the benefits of field research outweigh the inconveniences of navigating nature’s curveballs. While hands-on research is certainly rewarding, Li welcomes the offseason and the opportunity to take a break from rigorous fieldwork. When not in the lab, Li enjoys spending time with his wife and daughter, who recently began attending a preschool in the area. Still relatively new to Champaign-Urbana, the Li family is enjoying the chance to explore the town. They say that if you’re doing what you love, hard work doesn’t feel like work at all. Li is living proof that if you love the work you do, the possibilities are endless. And it doesn’t look like there’s any danger of that changing any time soon.